Miguel A. Custodio, Jr., and Vineet Dubey are tenacious litigators whose foremost objective is to zealously represent their clients. 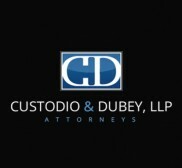 The attorneys at Custodio & Dubey, LLP have settled hundreds of cases in the Los Angeles, California, area. Their clients can attest to their many successful results.